At Summer NAMM 2010, Yamaha launched its DSR Series of active loudspeakers today which is designed to deliver class leading power, extreme sound pressure levels and a listening experience that re-defines high definition audio. 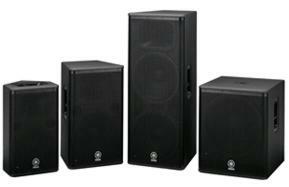 The DSR Series is comprised of three full-range models (DSR112, DSR115 and DSR215) and a subwoofer (DSR118W). It features a combination of advanced digital sound processing and the latest acoustic technologies for Integral Digital Tuning, plus the new D-CONTOUR (Dynamic-CONTOUR) multi-band dynamic processing for Intelligent Dynamic Control. Furthermore, they harness our next-generation high power Class-D amplifiers, featuring PFC switching mode power supply for Powerful Digital Drive while power supply, amplifiers, and transducers are continuously monitored by Extensive DSP Protection. "We are delighted to be able to release this groundbreaking DSR Series at last." said Kazunori Kobayashi, General Manager of Yamaha's Pro Audio Division. "All of our leading-edge digital technology, electronic and acoustic technologies have been incorporated into these new products."